Dartmouth is a town of considerable historic interest as well as scenic beauty. The harbour has been important since Roman times, and many Famous naval expeditions have sailed from here. Overlooking the town is the Britannia Royal Naval College. 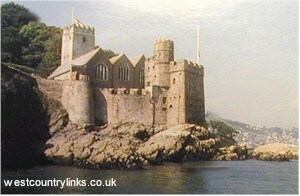 Dartmouth Castle (open daily throughout the year) stands at the mouth of the estuary; it was built between 1481 arid 1500 to protect the harbour against Breton raiders. On the opposite side is Kingswear Castle (not open to the public) at times of war a massive chain used to be stretched between the two castles to prevent enemy ships entering the harbour. The Butterwalk is a row of 17th-century houses on granite pillars, and in one of them is the Butterwalk Museum, a small maritime and nautical museum open daily from mid May to mid October. There are two ferries across the river Dart from Dartmouth to Kingswear. Take the lower ferry (capacity 6 cars, frequent service throughout the year), and from Kingswear. The naval tradition of this town goes back well before 1905 . Dartmouth streets as with so many ancient ports, consist of a melody of narrow thoroughfares extending from the waterside. Today Dartmouth is a haven for yachting enthusiasts with an annual Royal Regatta. Woodlands Leisure Park - All weather park with unique rides, playzones & indoor attractions. Animals, birds, 500m toboggan, watercoasters & more. Cafes and take-aways. Disabled access with assistance. 01803 712598.